In 1824, John Quincy Adams ascended from the role of Secretary of State to that of President of the United States. John Quincy Adams was the first and only (until George Bush jr.) son of a President to become President himself. His father, President from 1797 to 1801, was one of the most interesting of the American founders and has just a television series made about him by HBO. John Adams was a Boston man, drawn into the disorders of the American Revolution by his participation in the politics of Massachussets, he was a dominating figure throughout. Elected to the Massachussets council in the 1760s, a delegate at the convention in 1776, ambassador to Paris in the late 1770s, to Holland and then to Britain in the early 1780s, he returned to America to become the nation's first Vice President. He was an acerbic personality who had no taste for the intrigues of politics and quarelled with the equally talented Thomas Jefferson, his Vice President and succcessor as President, and yet he was a subtle analyst of politics and one of the great letter writers of American history, whose letters to his wife Abigail form one of the most moving archives of the period: not to mention his letters to Jefferson when both men were on the brink of death. It is an accomplishment that these writers and these producers chose Adams and not the more charismatic Washington or more superficially sympathetic Jefferson. Adams was a troubled man and his time at the top of American politics was troubled. They do not duck away from this, showing his disappointment as Washington effectively bans him from the cabinet, describing the disappointment of his Presidency, the way in which we was outmanoevred by his great rivals- Alexander Hamilton and Thomas Jefferson. They show the pain of the decisions he was involved in. The battles over the ratification of independence were long and doubtful- at least as vicious as those over the constitution ten years later. They show how deeply he was wounded by the personal slights, particularly early on that were thrown against him and how also his work effected his family. 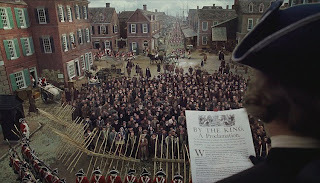 Adams spent most of the 1770s and 1780s away from his wife and children, across frontiers and seas from them, campaigning for a United States that might be free from British imperial control. Ideologically this series does not fully capture Adams. It understands the importance of law to the younger Adams and the importance of stability to the elder Adams. It does not capture the full subtleties of the ways that his opinions and experiences changed over the years. John Adams was a revolutionary who passed acts against seditious libel. He was a Federalist who spent the last years of his life corresponding with the idol, to this day, of the Democrat-Republicans, Thomas Jefferson. He was an advocate against tyranny who introduced measures to rename the President of the United States with royal titles. Like most of the northerners, though ambivalent about slavery (and his son was ferociously against it) he did went consciously into union with states that supported slavery as their raison d'etre. Maybe a television series is not the place to map out such complexities- but we should acknowledge they exist. And they existed for the other heroes of the Revolution: Benjamin Franklin, Thomas Jefferson, George Washington and the rest. This is a long and involved story and the series skips over sections with abandon. We do not see the negotiations with France or the negotiations with Britain. Adams and Jefferson go from friendship to exasperation with little in between. We do not understand the charming hold that Hamilton had over Washington, nor the reason why it was only the great General seemingly, according to the series, who fell for those charms and backed his nationalistic agenda. These gaps may be understandable- but they are sad when you place them besides the effort the series puts into the negotiations for independence which are well chronicled (or as well as can be expected) or the court case involving British troops, whom Adams defended. It would have been fascinating to see more of the negotiations in which Adams was involved in over the end of the war with Lord Shelbourne's administration. Fascinating too to get a sense of Adams's relationship with Jefferson breaking down: in the film it seems inexplicable that Jefferson would not have seen that Adams was playing a Republican game with Federalist means, in reality Jefferson was intelligent enough for that not to be true. Those are flaws. They are flaws common to most television programs about history- I have seen precious few television companies that do not believe a bonnet makes a good eighteenth century show- but they are offset by merits. One of the most obvious is the period detail and here I do not mean costumes but a sense of the pain of every day life. There is a scene of tarring and feathering which is wonderfully accurate and painful to watch. The moment when the votes are given for American independence is very good: you can feel as the votes are counted that even the counter does not quite believe what is happening- they leave a pause after the vote as the delegates sit back and realise what they have done and what scaffolds they have made for their own fall. Washington taking his oath without any ability to see his audience- the public- and almost whispering is another high point and watching the amputation of a breast- something that in those days occured without anaesthetic- was one of the most vivid historical experiences of the year for me (thankfully it is not too graphic). There are many others. Little details that remind you how much the American constitution and the American experiment was born of improvisation- as the most venerable constitution in the world (bar one) it is easy to forget how new the United States were in 1776. I am sure there are errors I have not spotted- this is not my era. The flaws are those of most historical productions from movie companies and television executives- they have very little sense of the stuff of history, that these people thought differently to us. The other flaws are mostly those of speed- six episodes is not enough to fit a life of the complexity of Adams's into. The series made me want to find out more about the second President of the United States though and I suppose that is a vindication. If this series sends more people back to read the words of Adams, Jefferson and Hamilton in particular then it can do only good. Errors are forgivable when the effort is there and my impression is that HBO did make an effort with this film: if not everything came off that is not their fault- what does is impressive. There is a quote from Locke in the title sequence- if that doesn't endear this to you, what else would?